Federal NDP Leader Tom Mulcair suggested Tuesday he would rather see Canada build a pipeline to carry crude from the west to the east than extend the Keystone pipeline to the U.S. Gulf Coast. 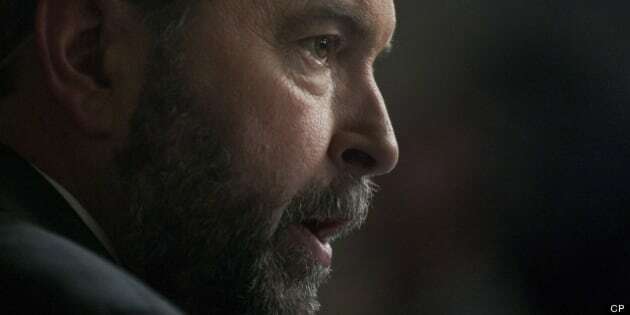 Speaking to reporters in Washington, where he's meeting with U.S. officials before heading to New York City, Mulcair said he would "give priority to creation of jobs in Canada, to taking care of Canada's energy security and getting a better price." He also indicated he's worried about low crude prices. "That's not good for the producing provinces because their royalties are lower, it's not good for the producers. And we're not creating jobs in Canada if we export raw. So that's one of the things we would do differently and something we've said for a long time," Mulcair said. "The best way to start doing that is to start moving product from west to east. And that would be a very good start. Getting to tide water is an important thing." But, he said, "This [Keystone XL] is the project that's on the table, I'm going to let the Americans come to their own decision on that. We know what we would do differently." Mulcair is joining a parade of Canadian politicians to the U.S. lately as he visits Washington and New York City this week. Natural Resources Minister Joe Oliver returned last week from speeches in Chicago and Houston, Texas, to promote Canadian energy exports. Three other ministers are travelling to Washington this week, and Saskatchewan Premier Brad Wall and Alberta Premier Alison Redford have both visited the U.S. recently to promote the oilsands. In Ottawa, Oliver called a press conference to tell reporters that Mulcair should back the extension of the Keystone XL pipeline during his trip to the U.S.
"At the minimum, the NDP leader's ambivalence and vagueness on this critical issue in Washington is not helpful, especially at a crucial moment for a decision by the U.S. administration. For someone who aspires to govern this country, it is an abdication of leadership to sidestep a crucial economic issue between our two countries and just focus on politics. Governing means standing up for Canada's interests and Canada's jobs," Oliver said. It's not clear whether Mulcair is addressing the issue of the Keystone XL pipeline, which would run from Hardisty, Alta., to the U.S. Gulf Coast, in his meetings with U.S. officials and the business community. The decision over whether to allow the pipeline extension lies with the State Department, which is expected to take until at least the summer to decide. A spokesman for Mulcair suggested he doesn't plan to raise the issue. "Mr. Mulcair has been and will continue to talk about energy and sustainable development, but the decision on Keystone lies with the Obama administration, and he is not here in Washington to tell the U.S. government what to do," George Smith said in an email to CBC News. Mulcair told reporters he'd gotten only one question about the pipeline, and said most of the questions he was asked were about the NDP and its economic policies. Oliver pointed to a 2011 visit to Washington by the NDP's then-environment critic Megan Leslie. Leslie said she was going to offer an alternative point of view on oilsands development. She's now one of the party's deputy leaders, something Oliver emphasized to make his point. "Because his deputy leader has spoken out against this proposal, this project, we have to assume that represents official NDP policy," Oliver said. "And so his remaining silent, without repudiating her position, means that he's against it. The fact that he isn't repeating his opposition when he's down in Washington is not an indication that the party has changed. It's just an indication that he doesn't want to talk about it." Mulcair's itinerary includes a meeting with the congressional budget office, an office on which Canada's parliamentary budget office is modelled. The Conservative government created the position of parliamentary budget officer when it came to power in 2006. The term of the first budget officer, Kevin Page, is due to end in two weeks amid criticism that the government isn't moving fast enough to find a successor. The government has complained that Page overstepped his mandate. Supporters of Page point to his ongoing fight for transparency in budget projections and more accurate estimates for items like the F-35 fighter jet. The government was forced to restart its fighter jet procurement after the auditor general backed up Page's cost estimates, which were much higher than those the Department of National Defence were reporting. - Canada's ambassador to the U.S., Gary Doer. - Democratic National Committee Chair Howard Dean. - Democratic House Minority Leader Nancy Pelosi. - The International Monetary Fund. - An editorial board meeting with business newswire Bloomberg.